This screen, in the Greely High School main office, displays video that monitors various parts of the school. It is part of a series of district-wide security upgrades made earlier this year. CUMBERLAND, Maine — After a lengthy and often heated discussion Monday about a new security system purchased for School Administrative District 51, the school board deadlocked on the nearly $166,000 equipment lease/purchase. The 4-4 vote defeated the proposal. Co-chairmen Jeff Porter and Bill Richards now will meet with Superintendent Robert Hasson and Finance Director Scott Poulin to produce a plan to either negotiate a lower price with the system vendor or convince board members to endorse the system, Hasson said Tuesday. The proposal could then return to the board for another vote, he said. Either way, the episode has left members of the board and the public with doubts about the School Department’s transparency and its compliance with board policies as it rushed toward the increasingly expensive system. 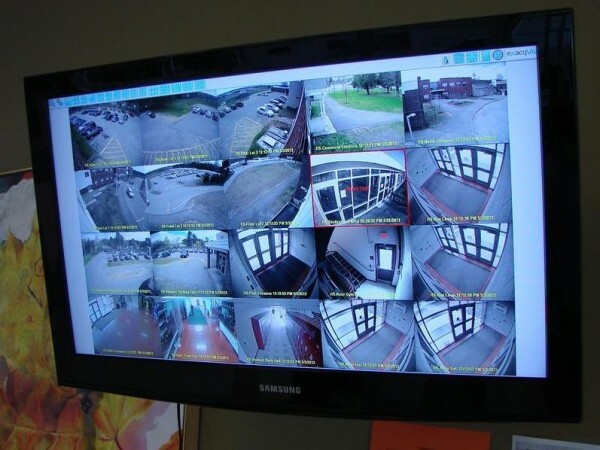 The Sandy Hook Elementary School shootings in Newtown, Conn., last December prompted a review of existing security systems in SAD 51 schools. In January, Hasson presented the school board with an estimate of $50,000 to $60,000 for a system including picture identification cards and swipe machines to allow visitors to enter the buildings. The cost eventually multiplied to $275,000 for a well-working visitor management system, he said. The resulting system — obtained from Westbrook company Surveillance Specialties — provides a photo ID to every employee, as well as police, fire and rescue personnel. Each card is programmed for specific doors, and cards for former employees can be deactivated. Each door in the district has been fitted with electric latches and controllers programmed for timed access and can be monitored on a computer screen. A phone video system is also in place for those who don’t have cards so they can be seen before being allowed entry. Cameras throughout each building are monitored by the school resource officer and other administrators. In an emergency, all doors can be locked down with the push of a button. The system came at a much higher cost than originally presented: about $275,000. Almost $166,000 of that was proposed Monday for equipment only, to be funded through a six-year lease/purchase program, at nearly $31,000 a year, starting in fiscal 2014. The approximately $110,000 remaining for labor could not be funded through a lease/purchase agreement; that amount was taken from the fiscal 2013 budget, thanks to savings reaped from refunding debt and energy cost reductions, according to Poulin. “It’s keeping kids safe, it’s keeping the staff safe, and I needed to move quickly on it,” Hasson said, noting that a review of the previous system revealed multiple cases where doors were left open and when unidentified people entered without being screened. Additional monitors, cameras and servers were also required for the new system, which increased the price, Hasson said. Hasson said there was no overall written proposal, and that “it was just, ‘go ahead and do that work.’ It was moving very fast, because we wanted to get [the system] in. He said he was informed of the price hike in mid-March by a board member who had heard the cost was much more than originally estimated. Hasson confirmed the price increase, but by that point the work had been done, and the system was in operation. He said he informed the school board of the change soon afterward at a budget roll-out. Several board members criticized the lack of information. He added that the board should have held a public hearing to air its thoughts on the matter. Cumberland Town Councilor Bill Stiles acknowledged that the issue is an emotional one, and wondered why there was such a rush to install the equipment. Marnie Dean of Cumberland, chairwoman of the Greely Parent Teacher Organization, said security was a concern of parents before the Newtown tragedy. Dean said she has not received any email messages from people upset about the system and its cost. Board member Jim Moulton said there was a communication problem. “What bid processes are applicable?” Moulton asked. According to a section of the school board’s policies pertaining to bidding and purchasing requirements, the district must “competitively bid purchases of equipment, supplies, materials or services” of more than $25,000, and if bidding is not used, the superintendent can seek requests for proposals for purchases of more than $25,000. “In this particular case, we have a specialized company on-hand who is our security vendor,” Poulin said. Board member Martha Leggat said she was initially a little skeptical after the Newtown shootings about a quick move to a security system. Talking to teachers in the district made her rethink her original assessment, she explained. “I can see how, in order for the system to work effectively, more things continually needed to happen to make all the pieces fit together so that we weren’t just sort of doing a patchwork job,” she said. Hasson said last week that if the school board rejected the lease/purchase plan, it would either vote again or the district would inform Surveillance Specialties it was unable to pay the bill, and the company would remove the system. Virginia Dwyer, Bailinson, Richards, and Leggat voted for the lease/purchase, while Bill Dunnett, Moulton, Vail and Porter opposed it.